Imagine you are riding in a bus in the middle of summer. It is hot, stuffy, and you are starting to sweat. Would you not wish for the air-conditioning to be turned on? I will be looking at how air-conditioning is represented in the comic “Buz and His Bus” by Harry Brunt from Commando Comics: No. 18 pg 1-3, why it is represented that way, and what that representation does to the readers. While reading this comic, I found it bizarre that they would introduce air-conditioning as this new and improved way to cool down only to put on such an elaborate show of its flaws. New inventions like this are quite helpful, so why would they go to such lengths to prove otherwise? I decided to do a bit of research to find out. It turns out that the answer is quite simple. It takes a lot of power to run an automobile air-conditioning system. In fact, “the overall diesel consumption of the engine will increase by 7%-38% when the vehicle’s A/C is operated” (Farrington, R.; Rugh, J., Impact of Vehicle Air-Conditioning on Fuel Economy, Tailpipe Emissions and Electric Vehicle Range: Preprint.). During WWll supplies such as food, gas, and rubber were precious. Many items were told to be saved in order to help contribute to the war effort. Fuel was one of them. Fuel was needed to help power military machines such as tanks and planes. To make sure there would be enough fuel for the war, fuel had to be preserved, starting with the home front. How was that fuel saved? By not driving unless needed, carpooling, and by, you guessed it, opening the windows instead of using the A/C. Going back to “Bus and His Bus”, it is clear why air-conditioning was shown in a negative way. Even though it was a groundbreaking invention, in vehicles it does use a large portion of the vehicle’s power and fuel to operate. During this time resources were slim and everything needed to be used in moderation. Fuel was needed for military purposes, so the common person had to compromise. How does this comic make its readers not use air-conditioning in their vehicles? By showing it in a negative light. The sign on the road, the man with the garlic, the skunk, the excessive use of stink lines (Figure 1); all are tools that are used to create a situation in which the readers can imagine themselves in. Scent is a string sense and many are able to imagine and react to a scent from a description along. By having the garlic and the skunk in the comic, the readers are able to imaging just how terrible that bus smelt. If they were in that situation they would want fresh air too. The comic conditions the readers to associate vehicle air-conditioning with horrible odours, then offers an alternative: open windows. It tells the readers that it is not worth using the air-conditioning in a vehicle if the windows are going to eventually be opened anyways. If they just open the windows they be able to stay cool and breathe at the same time. In “Bus and His Bus”, there is a strong emphasis on the shortcomings of air-conditioning. While it does cool you off, it does not allow you to open the windows in case the vehicle you are in starts to smell bad, The comic encourages its readers in a subtle and funny way to open the windows and contribute to the war effort by saving fuel. After World War II, the media, specifically in the form of television and film, newspapers, and comics played a large role in contributing to Canadian society’s perception of minority races. Commando Comics, a war comic series, attempts to provide historically accurate information to readers on World War II from the perspective of Canadian soldiers. The sixteenth issue of Commando Comics (1945) contains negative representations of minority races and depicts the Canadian heroes and soldiers as superior. I will be analyzing the negative portrayal of Japanese individuals and touch on the representation of German individuals in Commando Comics by observing the impact of this representation on minority races and how this affected Canadian society’s treatment of them. Furthermore, I will analyze how the comic and other forms of Canadian media degraded other races to promote Canadians as superior. The sixteenth issue of Commando Comics “promotes nationalism” (Montgomery 19), as the Canadian heroes are not only presented as the “right side”, but minority races are degraded and portrayed as the “enemy”. 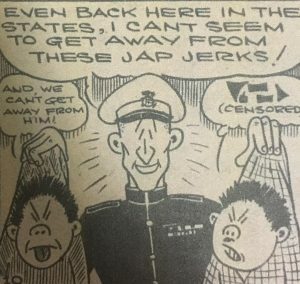 The constant use of stereotypes in this comic, as well as other forms of media during and after the war, contributed to society’s negative and unjust outlook on individuals of Japanese descent. Fig. 1. ‘Illustrations of Japanese soldiers’. Thomson. From “Ace Bradley Again!” Commando Comics No. 16, March 1945, p. 18. Bell Features Collection, Library and Archives Canada. Commando Comics heavily discriminates and stereotypes Japanese and German individuals based on physical attributes and language. The comic’s use of stereotypes contributed to the unjust prejudice that the media already held against minority races. A pilot story in the issue, “Ace Bradley Again!”, contains problematic illustrations of Japanese soldiers. As seen in Fig. 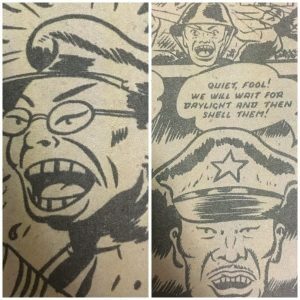 1, the soldiers are drawn with slanted eyes and protruding teeth, which are stereotypes that were and still are made about individuals of Japanese descent. 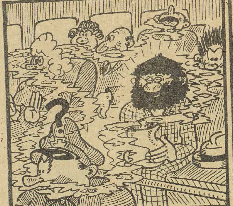 These stereotypes were heavily used in other anti-Japanese stories in the comic, as well as other forms of media at the time. The sixteenth issue also uses stereotypes in terms of language. In “Wings Over the Atlantic”, the dialogue of the German soldier is written in broken English and the character is given a stereotypical accent; for example, “I vill be safe and den ha-ha-ha, ve vill see if dey vill catch him,” (Andre 27). In this dialogue, the “w” is replaced with a “v” and the “th” is replaced with a “d” to give the character a stereotypical German accent. There is also an issue with the way that the Japanese language is represented. In “Lank The Yank”, a soldier says “Have bombs ready yesss?” (Brunt 24). This was done deliberately, to make it seem like the character is speaking in broken English once again. Furthermore, the dialogue of the Japanese soldiers is written in Japanese characters. In Fig 2, the word “censored” is under the soldier’s dialogue, to show that the soldier is cursing. The Japanese letters and soldier’s broken English are used to create a language barrier between the Canadian and Japanese individuals, in an attempt from the Canadians to try and differentiate themselves from the Japanese soldiers. In addition to this, the comic gives the Japanese language a negative connotation, as each time the Japanese letters are used, the soldiers are supposed to be swearing or insulting the Canadian soldiers. Fig. 2. ‘Use of Japanese language’. Harry Brunt. 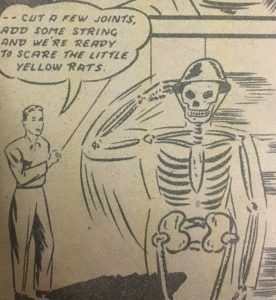 Panel from “Lank The Yank.” Commando Comics No. 16, March 1945, p. 25. Bell Features Collection, Library and Archives Canada. During my research, I found that many of the characters in the Canadian Whites comics are given stereotypes; not only classics such as Johnny Canuck and Nelvana of the Northern Lights, but in Commando Comics as well. The Canadian characters are stereotyped, however, the stereotypes seem to be positive and based off of well-known “Canadian stereotypes”, in contrast to the negative stereotypes that the comic uses for characters of minority races. 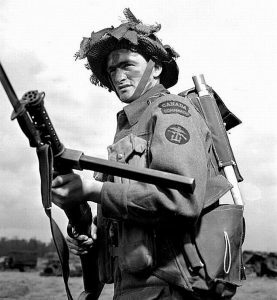 The Canadian soldiers are given traits such as striving for peace and avoiding violence; for example, in “The Young Commandos”, a soldier says, “it only goes to show how brave the lads in our armed forces are,” (Lazare 15) to enforce the idea of the brave Canadian hero. However, the Japanese soldiers are given traits, such as being dangerous or violent and are portrayed as the antagonists. The use of stereotypes is a theme throughout Canadian comics and characters, however, there is a clear difference in how the stereotypes are used; this difference is clearly based off of race. The idea that the Canadian soldiers are brave and fighting for justice is constantly reinforced, as is that Japan is “the enemy”. 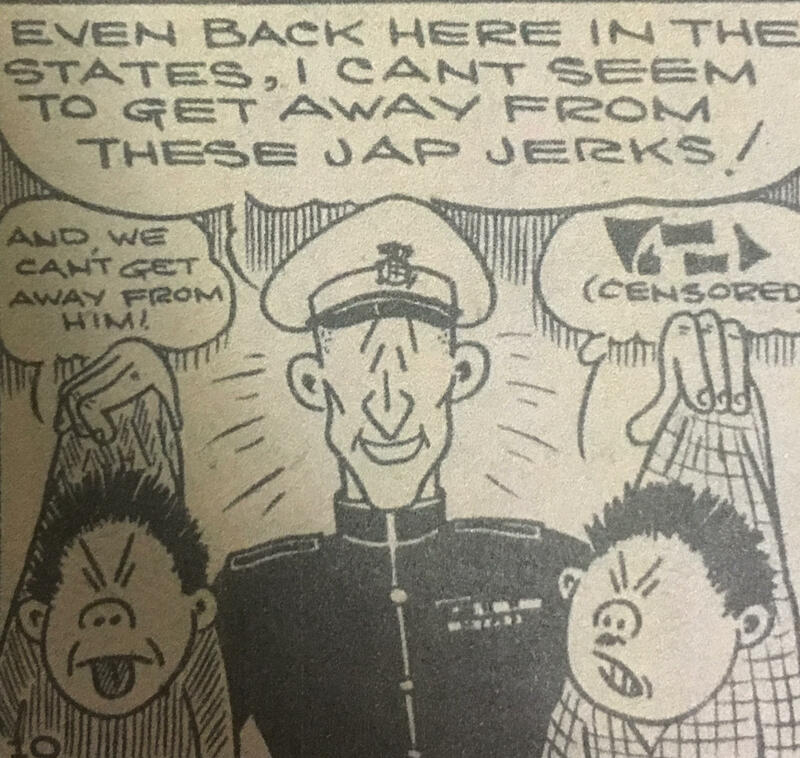 As war topics and violent content “dominated the mass media” (Montgomery 20) during the war, Commando Comics also contains racial slurs and explicit violence against minority races, specifically Japanese individuals. Throughout the entire issue, the Japanese soldiers are referred to as “nips” or “Japs” by the Canadian soldiers, which are derogatory terms. In “Clift Steele and the Island of Floating Death”, Clift says, “those nips’ll blow us to bits in a minute!” (Dariam 6). In “Lank The Yank”, Lank refers to the soldiers as “these Jap jerks” (Brunt 25). These are just a few of the numerous times that racial slurs are used against Japanese soldiers in the comic. These terms are extremely offensive, as they are derogatory abbreviations being used as an insult and are a sign of disrespect. Fig. 3. ‘Racial slur’. Thomson. Panel from “Ace Bradley Again!” Commando Comics No. 16, March 1945, p. 20. Bell Features Collection, Library and Archives Canada. In addition to racial slurs, the sixteenth issue of Commando Comics also discriminates against the Japanese soldiers in terms of skin colour. 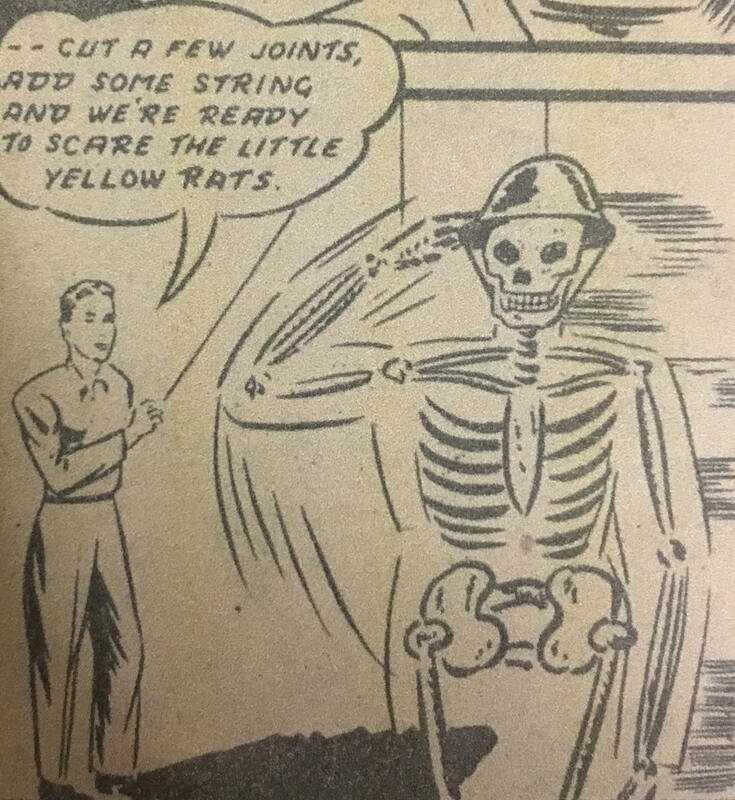 In “Ace Bradley Again!”, a soldier refers to the Japanese soldiers as “little yellow rats” (Thomson 20), which is extremely offensive. Furthermore, in “The Young Commandos”, Chuck, a Canadian soldier, does not want to fight and is called a coward by his fellow soldiers. His superior says, “You can’t turn yellow on me now!” (Lazare 13), which is a clear reference to skin colour once again. Moreover, the Canadian soldiers are using the phrase “turning yellow” (Lazare 13) to call Chuck a coward, which means they are referring to the Japanese soldiers as cowards. 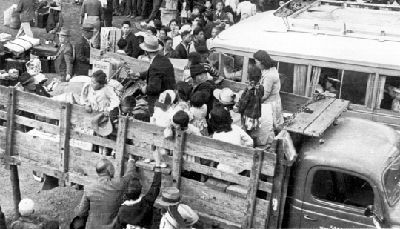 As a result of the unjust representation of Japanese individuals in the media and following World War II, Japanese families in British Columbia, many of which were Japanese Canadians, were forced into internment camps by the Canadian government. There was heavy racism expressed against Japanese individuals at the time, between 1942 and 1949, and they were unfairly denied of their rights. A substantial amount of Japanese families lost their homes and finances to the government, and were forced to move to the unpopulated areas of British Columbia. Although racism against Japanese individuals was mostly occurring in the west coast, it was present all throughout Canada. This racism was fuelled by World War II, as well as the news of the Pearl Harbour attack. The Japanese Canadians that tried to protest for their rights were sent to prisons. As a result of Canada’s actions towards the Japanese Canadians, the idea that individuals of Japanese descent were dangerous was promoted, therefore causing many people in society to be fearful and untrusting of them. Approximately forty years later, Prime Minister Pierre Trudeau apologized for the unjustified treatment of Japanese individuals that occurred during the wartime period (Marsh 1), however, it truly could not compensate for the suffering that Japanese Canadians endured. Fig. 4. ‘Internment camp’. James Marsh. Picture from “Japanese Internment: Banished and Beyond Tears.” The Canadian Encyclopedia, February 2012. Library and Archives Canada. An accurate representation of what Japanese Canadians experienced can be interpreted from Joy Kogawa’s novel Obasan, which tells her story of being forced into an internment camp and being “separated from her family” (Davis 60). The most interesting aspect of this novel is that it depicts a side of Canada that many readers might not be accustomed to, as Canada is often known as a multicultural society that is accepting of everyone. This novel provides insight on what Canada was like during and after World War II and analyzes how the transition to a multicultural society has allowed individuals to be ignorant of the fact that racism still exists in Canada to this day. During and after the war, the treatment of minority races was influenced by the way they were portrayed in the media. During this time, different forms of media, including comics, were promoting the idea that individuals of minority races were dangerous. This negatively impacted many aspects of their lives, such as employment opportunities and exclusion from jobs, and immigration restrictions. Many Canadians believed that minority groups were “undeserving” (Partias 10) of certain rights, such as voting. As there was constant “suspicion of foreigners” (Partias 15), many employers and workplaces’ racist views were accepted by those in higher power because society, as a whole, had an inaccurate outlook on minority groups. After the second war, many Canadians displayed uneasiness towards Japanese individuals, which resulted in unfair treatment and scrutiny. Although a vast majority of these individuals were Japanese Canadians, this factor was overlooked as the public was persuaded by the media’s representations, making them untrusting towards other races. The media played a large role in this as television, newspapers and comics constantly labelled Japan as the “enemy”. According to Partias’ observation, individuals of minority groups were only hired for jobs that were short of workers and that most Canadians avoided; in most cases, these jobs were low-paying and required hard labour. 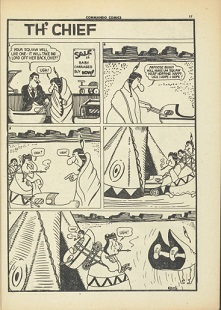 The negative portrayal and representation of minority races in this comic as well as other forms of media were used to uplift Canadian heroes and promote the Canadian race as superior. In “Representations of War and Peace in High School History Textbooks”, Montgomery discusses his analysis on how Canadian textbooks promote nationalism and present the information in textbooks as fact and truth. Similar to Montgomery’s theory, the comic promotes Canadian soldiers as the right side who are “fighting for a better world” (Montgomery 20) and portrays Japanese individuals as the antagonists; the comic presents these ideas as if they are facts and the truth. This strategy that many forms of Canadian texts seem to use can shape the reader’s perspective of minority races and overall, Canada’s outlook on minority races. Throughout the comic, there is clear prejudice against minority races, and these representations in the comic and other forms of media attempt to portray these races as inferior. 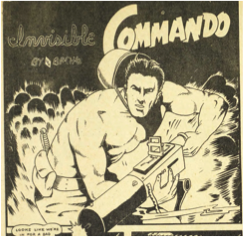 Although individuals in society held their own misconceptions about individuals of other races, the media, Commando Comics included, also promoted these negative ideas about minority races. The sixteenth issue of Commando Comics not only heavily stereotypes Japanese individuals, but also degrades them in order to portray Canadians as superior. When a time is remembered, it is most often for their heroes. Those who stand out as admirable are an embodiment of the epoch values and beliefs. Thus, to analyze a hero’s characterization is to know the impact of the time period on their personality. Furthermore, to seek out fictional work from a historical moment is to know the time-specific idealizations of a hero. In studying the “Canadian Whites,” a comic collection dating back to before the Second World War, there is a rare chance to understand the idealized Canadian hero (Kocmarek 148). Not too often does Canadian work spread as quickly and widely as the Bell Features comics did. The success was the result of an American comic ban placed by the Canadian government at the start of the war (Kocmarek 149). It is important to note that despite a recognizably lower quality of work than American competitors, (due to a lack of resources and experience) the children of the nation devoured Canadian comics. Readership was high and expectations were unimportant because of limited competition, giving the “Canadian Whites’” authors and artists freedom to create anything that their hearts desired (and resources allowed, which was not much considering that their materials only stretched so far as to print in black and white; hence the name “Canadian Whites”) (Kocmarek 148). The result has been an intriguing combination of references to both historic realities and dreams that provide a peek into World War II and those heroes who were ‘true’ Canadians. During the years 1939-1945 (World War II), Canadians were riddled with anxiety about the survival of loved ones. 1.1 million of the total 11-million-person population of Canada served in WWII (Granatstein). This large number of involved Canadians was reached only after years of careful, steady increases in governmental persuasion, working to make citizens into soldiers. With the extreme unease of potential enforced consignment, there was a desire for some reprieve (Granatstein). This came in the form of entertainment. Leisure during the war was defined by the government as citizen participation in activities that had the ultimate, overriding purpose of bettering the nation. In any case turning away from the war often resulted in turning to the arts that celebrated the underlying themes and feel of the nation, the war-stricken nation. In this vein of thinking it became clear that the importation of the American comic books was an unwanted method of “Americanization” in the eyes of the Canadian government (Morton). In order to lessen the grip of American culture on the related but certainly not identical nation of Canada, the American comic ban came to fruition (Foster). This governmental act not only allowed for an economic opportunity, albeit a naive one in the long run, but held the microphone to the lips of Canadian authors and artists, giving them a chance for their voices to be heard across the country. This chance gave life to the curiously ordinary Canadian hero. Ordinary insofar as the supernatural abilities of other comic heroes prevalent in the American market were non-existent in the vast majority of their Canadian counterparts. They were, however, extraordinary in their unique representation of Canadian ideals and values. In order to encapsulate the contextually important belief system of the time, the term “ideology” helps us to discuss “the way comics reflect various social and cultural beliefs in a given society” (Berger 377). It is evident within the “Canadian Whites” that the ideology, specifically about a citizen’s role, works as an assumed, universal belief by the heroes and fellow characters. Most often this means that there is a promotion of certain ideologies that have already been proven to be important in Canadian society or in other words it is about: “reproduc[ing] the status quo,” which in effect makes the comic “an instrument for mainstream ideological reproduction … [one of the] tools of indoctrination” (Mellor 122) (Pineda and Jimenez-Varea 1157). To be asserting these ideologies as nationally held was unquestionably a product of the war-time heightened desire to find unity and strong relations on every level of life. Its implication was that a wide audience experienced this decisive stance and were in some way affected in their beliefs. This is something that Caswell argues when he describes the comic as both resulting from and adding to the narrative about the society from which it is birthed (219). From understanding the larger context of Canadian pressures during WWII, we must seek to explore the consequence on the Canadian comic hero, what Beaty calls “a hero who had no superhuman powers” also known as the “Fighting Civil Servant” (430). The Canadian hero’s personality was not larger than life, but instead relatable and on most platforms, achievable. In the “Canadian Whites” comic collection, there are seven different types of comics produced and for the purposes of this study volume 16 of the Commando comics will be analyzed. There are distinctions to be made between the characters that populate the Commando comics but more significantly there are striking similarities between them. These similarities should be explained by the common traits of bravery, intelligence and good pilot skills. The traits are of course implications of the war time period, attested to by Beaty’s prescription of the comic hero being best “understood” through the examination of the ideology prevalent during their creation (428). Furthermore these specific traits add to the likelihood that the characters could be not only the heroes of the story but also that these representations of good Canadian character were attainable for the reader themselves, which was importantly not only suggested but encouraged. In this volume the first enticement of being a hero is when there is an implicit acknowledgement of brotherhood and friendship in becoming a soldier. The Canadian soldier is the occupation most conducive with the aforementioned traits. This sense of brotherhood between soldiers is established best when the text utilizes common ground language. In the story “Clift Steele and the Island of Floating Death” the two Canadian soldiers refer to each other as “fella” and “brother,” which indicates a shared understanding, relationship and experience (Dorian 4). This is a recurring instance in many of the stories. Although this exploration may seem to lean towards discovering propagandistic tactics of persuasion for nationalistic agendas, I would insist that this is a different case. 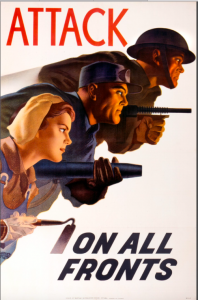 Despite promoting many of the same messages that government propaganda of the wartime typically would, propaganda is not meant to “foment enthusiasm or assent” (Skylar). This comic book very clearly incites enthusiasm and is implying desirability in terms of the conditions of a soldier’s life. The propagandistic feel of the text occurs simply from the inevitable leakage of ideology into the fictional heroes’ behaviours. Further to this point of being inviting to the reader, the text addresses its audience’s present state of youth in terms of ability and maturity by how it presents its advertisements. In the commercial for “a barrel-body chariot,” “microscope made from a spool” and “pair of stirrups” the products are advertised as “both safe and comfortable,” which seems at curious odds with the idea of a brave, heroic Canadian (R.S. 16). The fact is that the comic acts as an invitation to the youthful reader. The invitation says: we know you are only young children right now, but we want to teach you how to be like these heroes, so begin here with safe learning and then aspire to be brave, intelligent and great pilots. R.S. Panel from “Fun For You ‘Shades of Ben Hur’.” Commando Comics, no. 16, March 1945, p. 16. Bell Features Collection, Library and Archives Canada. Then the comic moves towards the next step, providing a more tangible motive to do these hard things. In the story “The Young Commandos” it is apparent that one action can lead to a specific reward. This is developed when the main character describes how his older brother “knocks down zeros” and then “gets medals and gals” (Lazare 11). Essentially, if you do this brave act then you get rewarded with the prominent desires of fame and love. The tale even ends with the reaffirming line: “That’s the story…and it only shows how brave the lads in our armed forces are!! !” (Lazare 15). This takes the hero character one step further to be inclusive of necessary participation in the armed forces and this is implied again to be the place most suitable for doing the heroic actions and then receiving the ideal rewards. Jerry Lazare. Panel from “The Young Commandos.” Commando Comics, no. 16, March 1945, p. 15. Bell Features Collection, Library and Archives Canada. In an expansion of the possible actions, the stories each work to outline different methods for achieving the same heroic status. For instance in “Ace Bradley Again” the hero is known for “seizing the moment” while in “Lank the Yank” the hero becomes intelligent and creative with weapon making when noticing a boot that is “not dainty but definitely useful” (Thomson 22) (Brunt 25). In “Wings Over the Atlantic” the hero “keeps a sharp look-out” and “tries to stop” the enemy and similarly, in “Professor Punk” the hero tries “to solve the problem” as hard as he can (Andre 27) (Brunt 46). There are countless more defining actions of heroes in each of the comic stories. Evidently the greatest gift that the superpower-less hero gives its readers is the picture of reality that comes across as less sensational than American heroes but is really the best way to “attempt to bolster the morale” (Weigel). If the superheroes of Canadian comics were not “essentially hatless Mounties out of their scarlet tunics,” but instead supernatural, entirely fictional characters then the outcome would be far less potent for inspiration, potentially even ineffectual (Kocmarek). In a time of great horror plausible optimism seems to be the comic book’s answer to the unsure nation. After consideration of the traits that the comic heroes ascribe to, it is important to establish the likely impact on its readers. Knowing that the “Canadian Whites” heroes were “based on the real life exploits [of Canadian heroes] … [and that] most of their characters and stories had Canadian backgrounds and connections,” it becomes a reaffirmation and further repetition of the things that one must do to become great (Kocmarek). The audience was largely males ages eight to twelve who were born into a time of distress and would naturally be motivated and interested in solving the problems that they faced daily (Foster). The messages that were conveyed by the portrayal of the Canadian hero were doable things that a child could hold onto. It was also a means to negotiate the role that they saw their nation playing in the conflict. For adults war was interpreted through news that was circulated. In a Toronto Daily Star article from 1944 a soldier is described with the utmost admiration for his heroic actions that saved lives because of his bravery in the face of fear (“Canadian Hero of Ortona”). This was celebrated because Canadians desperately needed something to be hopeful about. The heroes were discussed at length because they were meant to inspire people to do the tough things that humans are tempted to shy away from. The young men who read comics were likewise establishing themselves in a narrative. While they knew the hardships of war, they did not have much information on the state of the conflict, in fact: “The comics provided that young audience, which did not read newspapers … with probably their only source of information on the war” (Kocmarek). With little real information the comic book audience may have been subjected to a “clever way of sugaring an ideological pill,” but they inevitably also gained hope from those heroes who did not seem quite so far away from their reality (Mellor 123). These arguably goofy, short comic stories were a way to give “interpretive agency to the reader (an empowerment perhaps especially important to readers in the liminal state of adolescence)” and one that could very well have made all the difference in a choice between mediocrity and heroism (Hatfield and Svonkin 433). These comic book heroes were role models that gave unique hope to their avid readers. When one thinks of comic books, what almost immediately comes to mind are children. Cheaply made, with storylines of superheroes and “funnies”, intellectual adults are rarely associated with such trivialities. However, if one were to analyze a comic book more closely, much can be revealed about the creators, readers, and society during the time of production. This information can be revealed not only from the narrative of the comics, but also from the visual styles and illustrations throughout a comic collection as a whole. When looking at Canada’s comic book collection, specifically those produced in the 1940s, it is apparent that comic books can also be seen as war memories. WWII was a turbulent time for Canada as well as the comic book industry, which ultimately led to the birth of the “First Age of Canadian Comics” after Canadian parliament declared the War Exchange Conservation Act (WECA) which restricted American comic books from being imported into Canada (Kocmarek 148-149). These Canadian Whites–named for being printed in mostly black and white–focused on Canadian superheroes and content. In Issue 13 of Bell Features’ Commando Comics (1944), one of the Canadian Whites, the main focus of each feature is the war against the Nazis and the Japanese. The celebrated “superheroes” are regular Canadian soldiers, rather than individuals with superpowers. Each feature is written and designed by various creators and the visual styles are all vastly different; however, their underlying themes appear to remain the same. 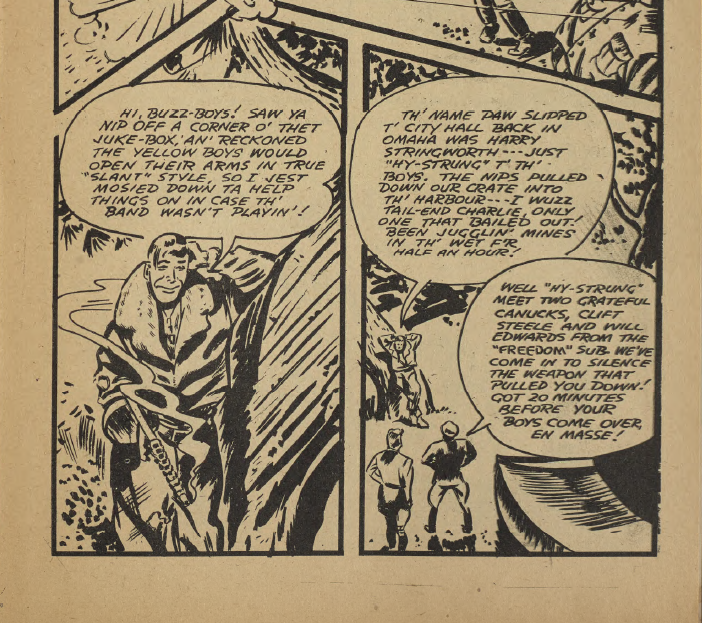 Upon closer examination of the two features in Commando Comics Issue 13, “The Young Commandos” by Jerry Lazare and “Professor Punk” by Harry Brunt, it can be seen that different visual and illustrative styles are used to convey meaning to readers through the way the stories appear on the page. Although “The Young Commandos” is drawn in a more realistic visual style and “Professor Punk” is drawn in a humorous cartoon style, messages of propaganda can be deciphered from each feature both overtly, as well as through closer examination of the subtext revealed through the images. There are many visual styles and elements employed in the design of comic books that shape the meaning of the images that surround the narrative. Sometimes images are presented on their own without text, which provides a direct and bold statement to the reader. In comic books, the use of design elements such as page layout, panel shape and size, arrangement, and page placement contribute to the pacing of the narrative, which ultimately evokes tension and emotions through each scene (Jakaitis and Wurtz 211). For example, larger panels will draw a reader’s eyes quicker than smaller panels, oddly shaped panels will stand out as important, action that bleeds through the gutter from one panel to the next will create a feeling of fast paced anxiety or action that cannot be contained, and actions that are drawn out across multiple panels in moment to moment action sequences will prolong the tension of a scene. In reaction to war themed comics, these illustrative displays grow to be very meaningful. The manipulation of the combination of images and text imparts different value systems–here referring to political beliefs–and can create propaganda within the illustrative content both overtly and covertly (Jakaitis and Wurtz 130). This idea of comic book illustrative style as propaganda is evident in both “The Young Commandos” and “Professor Punk”. “The Young Commandos” (TYC) is a short, continuing feature that focuses on a group of young soldiers who work together to capture a Nazi spy who they then use to also trick and capture his Nazi leader (Lazare 14-19). 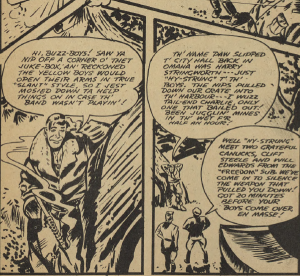 This feature appears as the third sequence in the issue, and when compared to other features within the comic, it can be seen that TYC has a very distinct visual style. Figure 1: Lazare, Jerry. 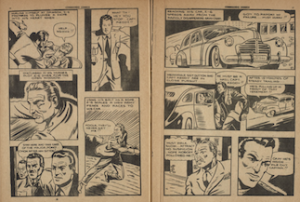 Sequence from “The Young Commandos”. Commando Comics, No. 13, September 1944, p. 16-17. Bell Features Collection, RULA Archives and Special Collections, Ryerson University, Toronto, Canada. This six page feature is drawn in a realistic, Film Noir storyboard style and includes different scenes and angles that would typically be used in movies. If referring to Figure 1, some visual film techniques such as close ups of faces, chase sequences spanning multiple panels with different angles of a car, and medium shots of static action such as dialogue can be seen. The feature is drawn in a complex story layout in which the panels are all different sizes and arranged in changing layouts on each page, such as in Figure 1. Throughout the feature, the action from one frame will even bleed through the gutter (the space in between frames) and extend into the next frame. This can be seen in Figure 1 in both the fifth panel where the villain’s leg extends past the gutter back into the fourth panel, and in the seventh panel where one of the Young Commando’s arm extends across the gutter into the next panel. Here readers experience a sense of urgency in the action which is too grand to be contained in a single frame. The Film Noir visual style is an important aspect to note in its use in TYC since it emerged as a prominent film genre in the 1940s at the same time Bell Features began to make the Canadian Whites (Conrad 1). Film Noir makes use of dark, negative space and plays with lighting to create interesting shadows that change the intensity and mood of each scene (Conrad 2-3). In Figure 1, we can see this technique of dark, negative space being employed, especially in the close-up panels as a way of heightening tension and the emotion of the character in the panel. Film Noir also deals heavily with themes of disorientation, alienation, pessimism, and a rejection of traditional ideas about morality (Conrad 7). These are the same attitudes that were commonly felt and broadcasted by the Canadian population during the Second World War. This is further highlighted in an article from The Globe and Mail on December 4, 1941, when B. A. Trestrail, president of the Canadian Radio Corporation, announced that 90% of Canadian attitudes toward the war were those of complete detachment and apathy (Globe and Mail 4). The article ends as a call to arms for Canadians to show more interest and exert more effort toward the war, a message that is also evident in TYC. True to the Film Noir style, all of the frames in TYC contain a lot of black, negative space which creates drama within the images. We also see characters’ faces shadowed in different ways depending on the tone of the scene. The images themselves; however, are very heroic which is in conflict and a direct rejection of the typical film noir style. In Figure 1, for example, we see our Canadian heroes engaging in a chase scene and gallantly pursuing their enemy, which makes them come across as very bold and determined, rather than apathetic and disassociated. The contrast between the valiant action in the feature and the Film Noir style is subconsciously hinting at readers that they too can rise above the pessimistic and apathetic attitudes and fight to be more heroic and patriotic. These characters aim to instill patriotism and build support on the home front during a time of crisis as well as aim to inspire children to want to fight for their country (Scott 54). Since TYC urges patriotism and heroism it can be read as a piece of propaganda. Here, propaganda refers to anything that attempts to influence the public’s opinion, as well as attempts to affect later behaviour, including actions toward the war. The purpose is not exactly to properly educate the population on events, but rather to change or solidify attitudes, behaviours, and ideologies (Seidman 414). If TYC is aiming to change Canadian attitudes toward the war and encouraging Canadians to be more patriotic and involved in the war effort, then it is in fact propaganda, but can the same be said for “Professor Punk”? Figure 2: Brunt, Harry.“Professor Punk”. Commando Comics, No. 13, September 1944, p. 20-21. Bell Features Collection, RULA Archives and Special Collections, Ryerson University, Toronto, Canada. “Professor Punk” appears as the fourth feature in Issue 13, directly following TYC. We immediately see a drastic shift in visual styles. Rather than the realistic human facial features and film-like storyboard quality of the illustrative style in TYC, “Professor Punk” appears as a two-dimensional humorous cartoon. “Professor Punk” is a very short, two page feature that focuses on a crazy professor who is asked to create a new type of bomb for the war. He decides to fill bomb shells with termites instead of explosive material so the termites will eat Berlin to the ground rather than burn it (Brunt 20-21). Although this feature still focuses on the war, it is more comedic than TYC and has a much less serious tone. Also unlike TYC, all of the action in “Professor Punk” is contained within the panels without ever bleeding over the gutter into the next frame. As seen in Figure 2, the gutters in “Professor Punk” are much smaller than those in TYC which creates a feeling of less time passed between frames and less tension between actions. Figure 2 also displays the employment of the simple story layout technique through the ten panels that are all of the same shape and size, consisting of static, medium, or wide shots. The feature is free of action sequences that are prevalent in TYC. Each panel is simply drawn in a way that furthers the narrative in an action to action sequence, never lingering on or going back to any one action. In a visual style so different from that of Film Noir, can “Professor Punk” also be read as propaganda? The Canadian comic books that emerged during WWII were also used as a tool to enlighten younger or less educated readers about current and historical events (Scott 54). On the surface, this feature does not appear to be a piece of propaganda; however, once examined closer, elements of propaganda can be deciphered. While the feature is humorous and engaging, it also enlightens readers that there is a war going on and Berlin is one of the enemies. The lighter, less intense tone, as well as brighter images in comparison to TYC, makes the content easier for young readers to relate to since it is simplified. This can be seen in Figure 2 where the action of dropping bombs is contained in only one frame and the violent destruction that bombs usually cause is instead reduced to the less destructive image of termites eating away at Berlin. This drastically downplays the act of violent destruction. Oversimplification is a key factor for propaganda through the act of playing on the emotions of viewers and readers by presenting them with something visually appealing and easy to relate to or understand (Seidman 414). 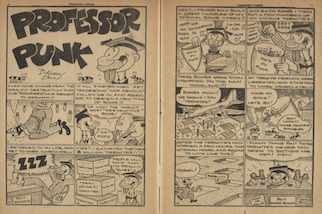 While “Professor Punk” is funny and engaging, it also contains serious images relating to the war, such as the subtle image of Hitler in panel one in Figure 2 (where his name is never actually stated) and the poster in Professor Punk’s office in panels three and ten urging readers to “Buy More Bonds” (Brunt 21-22). Subconsciously, readers are taking in this visual information and forming opinions of the war based on it; however, this form of propaganda can be useful. It is said that those who do not understand the past are doomed to repeat it. Comic books are an efficient way of disseminating a message to the relatively uninformed masses and the sooner history is instilled in the minds of children, even subconsciously, the better chance they have of correcting those wrongs in the future (Scott 16). Although the message in “Professor Punk” can also carry positive undertones, the feature can still be read as a propaganda piece. While the Canadian Whites emerged as a response to the banning of American comic books, they were effectively able to provided young readers with entertainment as well as important information on the war through a medium that was easy to understand and relatable to younger readers. Through differing visual styles and the arrangement of images, both “The Young Commandos”and “Professor Punk” are effectively able to convey meaning to readers through the way the stories appear on the page. Although “The Young Commandos” is drawn in a more realistic visual style and “Professor Punk” is drawn in a humorous cartoon style, messages of propaganda are present in both features both overtly and covertly, ultimately suggesting that the Commando Comics were used as a way of influencing readers to be more patriotic and essentially want to fight to protect their country, just like their favourite heroes from The Canadian Whites. Brunt, Harry. “Professor Punk.” Commando Comics, no. 13, September, 1944, p. 20-21. Canadian Whites Comic Book Collection, 1941-1946. RULA Archives and Special Collections, Ryerson University, Toronto, Canada. Conard, Mark T., and Robert Porfirio. The Philosophy of Film Noir. Paperback ed., Lexington, UP of Kentucky, 2007. The Globe and Mail. “WAR EFFORT, PARTY POLITICS ARE DENOUNCED: B. A. Trestrail Blasts Attitude of Canadian People as a Whole POINTS TO APATHY.” Globe and Mail [Toronto], 4 Dec. 1941. ProQuest Historical Newspapers, ezproxy.lib.ryerson.ca/login?url=http://search.proquest.com.ezproxy.lib.ryerson.ca/docview/1356324368?accountid=13631. Jakaitis, Jake, and James Wurtz. Crossing Boundaries in Graphic Narrative. McFarland & Company, Inc., Publishers, 2012. ProQuest Ebook Central, ebookcentral.proquest.com.ezproxy.lib.ryerson.ca/lib/ryerson/reader.action?docID=876782&ppg=220. Kocmarek, Ivan. 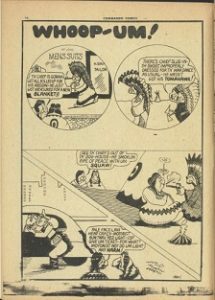 “Truth, Justice, and the Canadian Way: The War-Time Comics of Bell Features Publications.” Canadian Review of Comparative Literature / Revue Canadienne De Littérature Comparée, vol. 43, no. 1, Mar. 2016, pp. 148-65. Project MUSE, doi:10.1353/crc.2016.0008. Lazare, Jerry. “The Young Commandos.” Commando Comics, no. 13, September, 1944, p. 14-19. Canadian Whites Comic Book Collection, 1941-1946. RULA Archives and Special Collections, Ryerson University, Toronto, Canada. Scott, Cord A. Comics and Conflict. Naval Institute Press, 2014. ProQuest Ebook Central, ebookcentral.proquest.com.ezproxy.lib.ryerson.ca/lib/ryerson/detail.action?docID=1577594. Seidman, Steven A. “Studying Election Campaign Posters and Propaganda: What Can We Learn?” International Journal of Instructional Media, vol. 35, no. 4, Fall 2008, pp. 413-26. Academic OneFile, go.galegroup.com.ezproxy.lib.ryerson.ca/ps/i.do?p=AONE&u=rpu_main&id=GALE%7CA273359031&v=2.1&it=r&sid=summon&authCount=1.